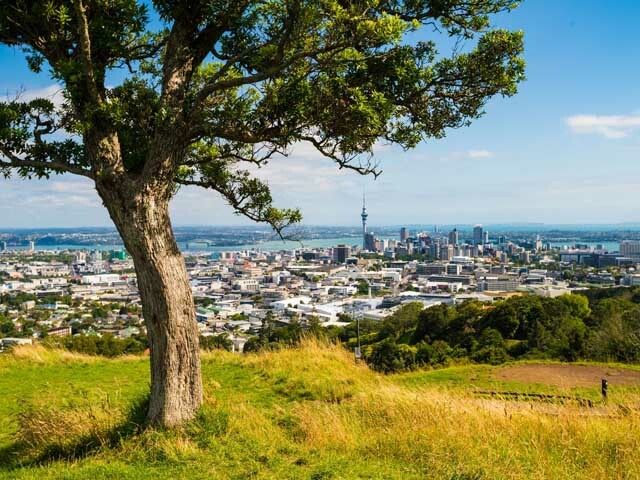 Check out these Oceania Cruises deals – Search for the lowest ticket prices! The term “concierge” evolved from a French phrase referring to the person who tended to visiting nobles. Treating guests royally is also the guiding principle behind the design of our Concierge Level Staterooms (A1, A2 and A3) in preferred locations on deck 7. These beautifully decorated 216-square-foot staterooms mirror many of the luxurious amenities found in our Penthouse Suites, including a private teak veranda, flat-screen television, plush seating area and spacious closet. Comfort and convenience are the hallmarks of these extraordinary staterooms. 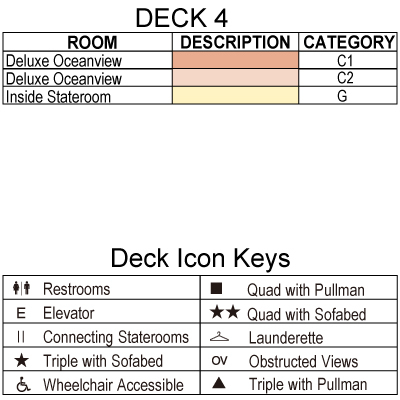 Category A1 staterooms are located in the mid section of deck 7. With the curtains drawn back and the ocean in full view, these spacious 165-square-foot staterooms, located on decks 4, 6 and 7, feel even more commodious. The custom-designed furnishings and stylish fabrics only add to the allure. Features include queen or two twin bed accommodations, spacious seating area, vanity desk and breakfast table. 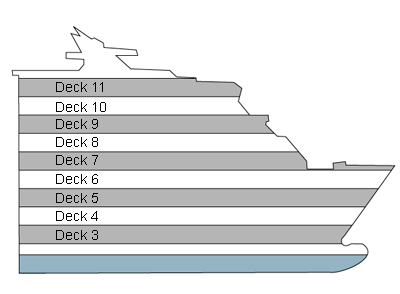 Category C1 staterooms are located in the mid section of deck 4 and in the forward sections of deck 6 and 7. It’s like another world inside these private retreats, which boast 160 square feet of beautifully designed luxury. The comfortable furnishings and warm woods add to the serenity. Each stateroom features a comfortable seating area, vanity desk, plenty of storage space, and queen or two twin bed accommodations. 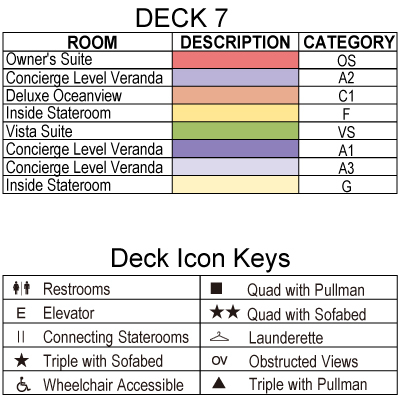 Category F staterooms are located in the mid-sections of decks 7 and 8. Designed to maximize space, these exquisitely appointed 165-square-foot staterooms on deck 3 offer the comfort of queen or two twin bed accommodations, a seating area with sofa, vanity desk and breakfast table. Spectacular seascapes can be seen through a classic porthole. The most spacious suites span nearly 1,000 square feet, every inch devoted to your pleasure. Located in premier corner locations on decks 6, 7, and 8, they present a wealth of amenities, ensuring that each moment is a pure delight. Ease into your own Jacuzzi. Watch first-run Hollywood movies on the 42” plasma flat-screen TV with Bose surround sound system or on a second flat-screen TV from the comfort of your bed. Play DVDs and CDs in the entertainment center, or access the Internet from the laptop computer provided while enjoying a favorite beverage from the refrigerated mini bar. Wake up wonderfully rested on the queen-sized Tranquility Bed. Draw back the curtains from the numerous floor-to-ceiling glass doors and enjoy spectacular views from the wraparound teak veranda furnished with resort-quality outdoor lounge furniture. There’s even a second bathroom for guests. 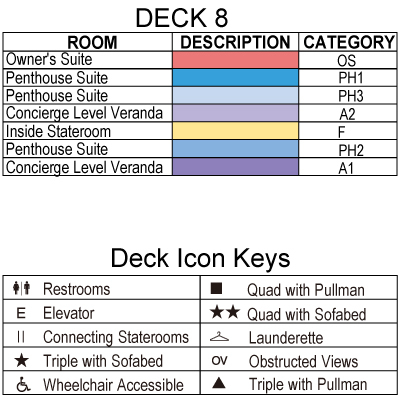 Located exclusively on deck 8, the collection of elegant Penthouse Suites features every imaginable creature comfort, much like a world-class hotel. Ingeniously designed for maximum space, each 322-square-foot oasis offers an immensely comfortable queen-sized Tranquility Bed which may be converted into two twins. There’s also plenty of space for the living area, private in-suite dining, refrigerated mini bar, vanity desk, and a bath with a tub. More room and even more magnificent views await you through the sliding glass door on the exquisitely furnished private teak veranda. 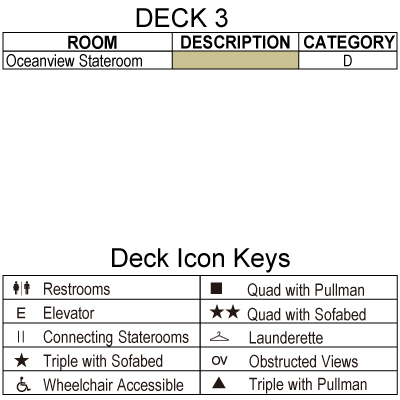 Category PH1 staterooms are located in the mid-section of deck 8. Located throughout deck 6, these handsomely appointed, 216-square-foot staterooms boast the most requested luxury – a private teak veranda. Watch the world sail by while comfortably seated outdoors, or relax on your comfortable sofa inside. Other conveniences include a vanity desk, breakfast table and choice of queen or two twin bed accommodations. 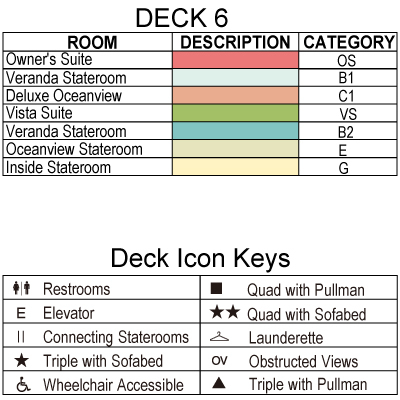 Category B1 staterooms are located in the mid section of deck 6. The most coveted suites with 786 square feet devoted to your pleasure. With sweeping views over the bow, they also present a wealth of amenities, ensuring that each moment is a pure delight. Ease into your own Jacuzzi. Watch first-run Hollywood movies on the 42” plasma flat-screen TV with Bose surround sound system or on a second flat-screen TV from the comfort of your bed. Play DVDs and CDs in the entertainment center, or access the Internet from the laptop computer provided while enjoying a favorite beverage from the refrigerated mini bar. Wake up wonderfully rested on the queen-sized Tranquility Bed. Draw back the curtains from the numerous floor-to-ceiling glass doors and enjoy spectacular views from the wraparound teak veranda furnished with resort-quality outdoor lounge furniture. There’s even a second bathroom for guests. The two stylish boutiques feature a bounty of items ranging from sundries to designer casual wear. Feel free to browse through the array of duty-free merchandise including fine jewelry, fragrances and Oceania Cruises logo wear. Discover a legendary spa experience aboard Oceania Cruises. 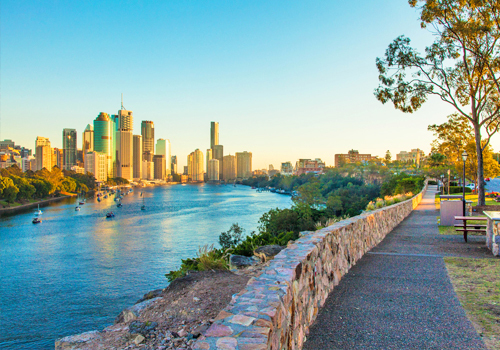 Award-winning Canyon Ranch – with its family of destination health resorts, hotel, wellness communities and SpaClub facilities – has been the acknowledged world leader in healthy living expertise, and a haven of luxury, comfort and warmth for 30 years. 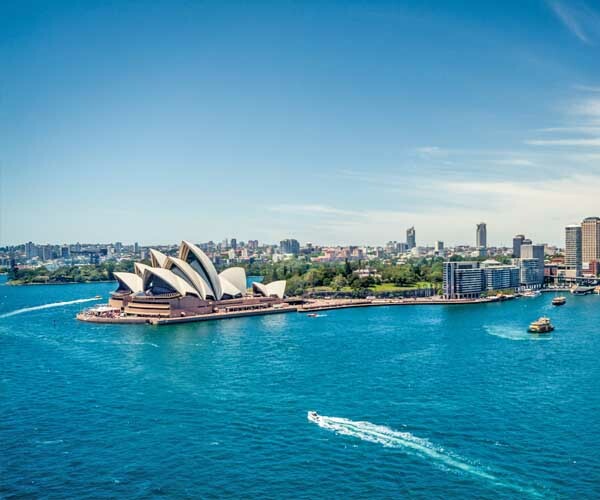 Experience the profound pleasures of Canyon Ranch in a spectacular setting – Oceania Cruises’ fleet of luxurious cruise ships. Enhance your voyage with indulgent services, enlightening presentations, nurturing wellness services and exercise classes that promote resilience, restore serenity and leave you feeling fantastic. Enjoy! The beauty professionals can help you look as terrific as SpaClub® makes you feel! Lady Luck always seems to be present in the casino, coaxing jackpots and eliciting squeals of delight. Take one of the slot machines for a spin or join a rousing game of blackjack, poker, or roulette. If you’re an aficionado of the arts, you’ll find our entertainment just as engrossing and personally satisfying. In the evenings, the ship is filled with music performed by, what some have called, the finest orchestra at sea. Attend a live classical concert under the stars, the notes gently wafting through the misty night. Marvel at the magicians, comedians and other headliners. Evenings aboard can be anything you desire. Chat with newfound friends over a cocktail in one of the eight lounges. Dance the night away in Horizons to the sounds of a marvelous musical group. Entertainment has never been so enjoyable, enriching or varied. An observation lounge with dramatic floor-to-ceiling windows offers captivating views, sweeping vistas and a convivial bar in which to enjoy the favorite cocktail. The martini exudes luxury and sophistication. Sample a selection of these fine cocktails from ther convivial bars and lounges, or learn about the intricacies and history of the drink from the head bartender. Located in the Polo Grill, the Polo Bar is the perfect place to gather with friends and relax while you sample an almost infinite variety of premium, single-malt Scotch and full-grain whiskeys. From headline acts to comedians and magicians to lively jazz ensembles, the ship lounges are the center of nightly entertainment aboard Oceania Cruises. Travel to the most remote, exotic lands and never be out of touch. 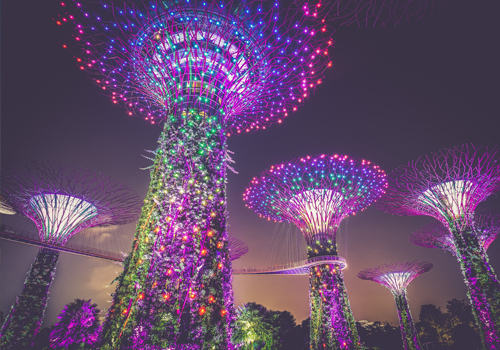 The Internet center is open around the clock so you can stay connected with loved ones through email, check the latest business news and stock prices, or research your next port of call. If you're a computer novice, the computer staff will gladly provide private lessons. Or join group classes in subjects ranging from beginner's level Microsoft Windows XP to image retouching with Adobo Photoshop Elements, and a variety of digital photography classes. Enrich your mind in the tranquility of the English inspired Library with over 1,000 volumes ranging from destination-specific guide books to best-selling mysteries to classic literature. With a large heated pool and three whirlpool spas, there is always room for a refreshing dip in the pool, poolside relaxation, or a soothing spa experience. Exceedingly stately and dignified, the Grand Dining Room exudes a warm, convivial ambiance. This is luxury on a grand scale, but approachably so. The handsome décor captures the spirit and splendor of a European, 5-star restaurant. Tables are beautifully set with Versace bone china, sparkling Riedel crystal, gleaming Christofle silver and fine cotton linens. Majestic, hand-painted frescoes adorn the domed ceiling. Perhaps most remarkable, the elegant setting is but a prelude to the magnificent culinary feats to follow. Service from the formally attired wait staff is impeccable, as they serve an astonishing variety of French-inspired Continental dishes, course after course. Thoroughly classic in every sense, the intimate Polo Grill embodies a certain timelessness long associated with the world’s finest steakhouses. A triumph of elegance, the restaurant possesses a gracious, traditional atmosphere, courtesy of its crisp, white linen tablecloths, dark-wood furnishings and supple, high-back leather chairs. The Hollywood legends, whose black-and-white photographs grace the walls, would clearly feel at home in the Polo Grill. It is that classic, especially on evenings when the moonlight can be seen dappling the sea through the restaurant’s expansive windows. Each course is a consummate expression of perfection, a time-honored favorite. Each evening, this alfresco dining area offers a sumptuous buffet. Here you will enjoy dining under the stars, specialty cocktails and a menu of authentic tapas, paellas and other flavorful regional specialties from Spain and the surrounding Mediterranean. The buffet allows Guests a bountiful selection of traditional favorites including carefully prepared entrees, salads, soups, and a carvery with tantalizing desserts to finish. 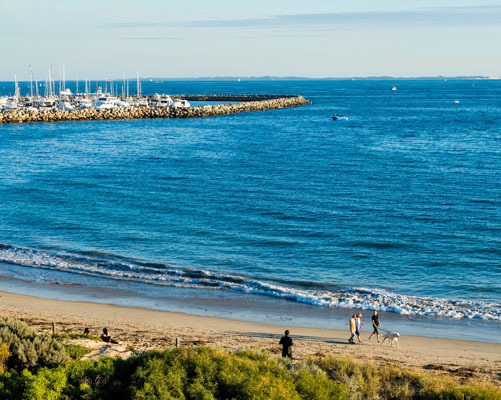 We strive to provide a relaxing and enjoyable dining experience, one that encourages you to lose yourself in the splendor of the passing scenery and good company of your fellow shipmates. Hailed for its simplicity and keenly balanced flavors, Tuscan cuisine is firmly rooted in family traditions. Many of the recipes used to create the authentic Tuscan dishes in Toscana have been handed down from generation to generation, coming to us from the ship-owned Italian culinary staff. Similarly, the sommeliers are from long lines of wine-producing families, so they inherently know the characteristics of each vintage and can suggest a wine that perfectly complements your meal. Presented on elegant, custom-designed Versace china, each dish is a masterpiece that exemplifies the essence of Tuscany. The casual ambiance of the Waves Grill, which occupies a spacious, shaded corner near the swimming pool, belies its mouth-watering luncheon menu. 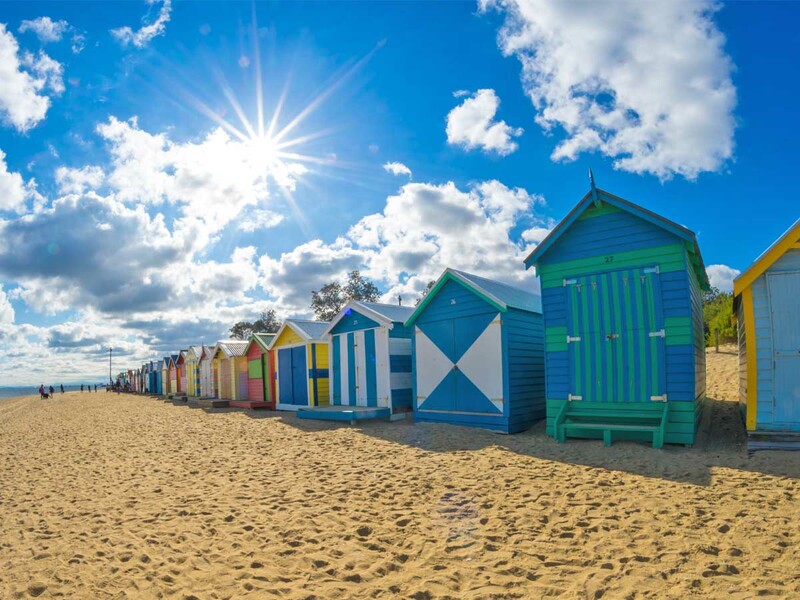 Come straight from lounging about in the sun, or for a quick meal between tours, and dine from an outstanding menu of gourmet burgers, tangy barbecue and succulent seafood. It’s an open galley, so you can watch the chefs grill each delectable item to order, while you select side dishes such as healthy, garden-fresh salads and crispy, hand-cut fries. For a grand finale, savor a cup of creamy gelato, a bowl of homemade ice cream, or a hand-dipped, made-to-order milkshake.